Can you believe it? Nick may not be back to normal yet (what is normal, anyway? ), but he and his lead trainer decided it was time to move on. A bitter sweet accomplishment. 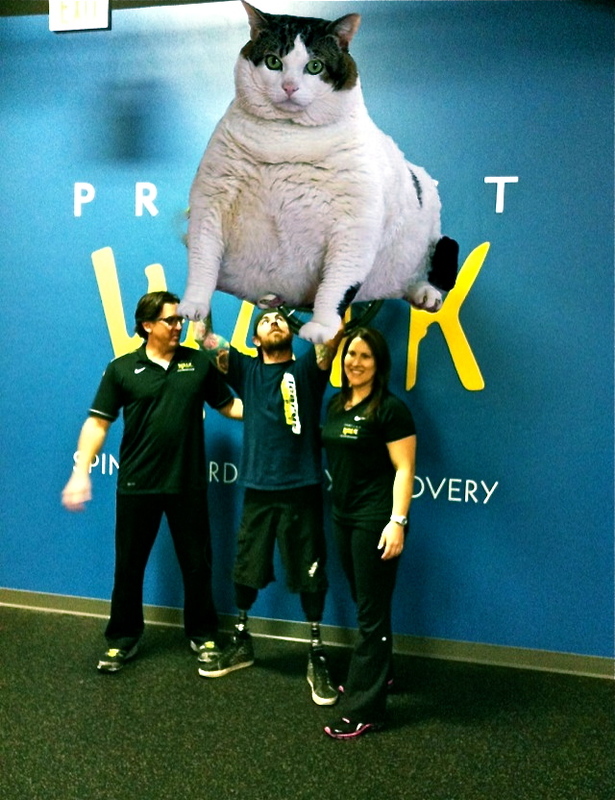 Eric, Bri, and a very proud Mr. Fener enjoying a mini-photo shoot on Nick’s last day at Project Walk. 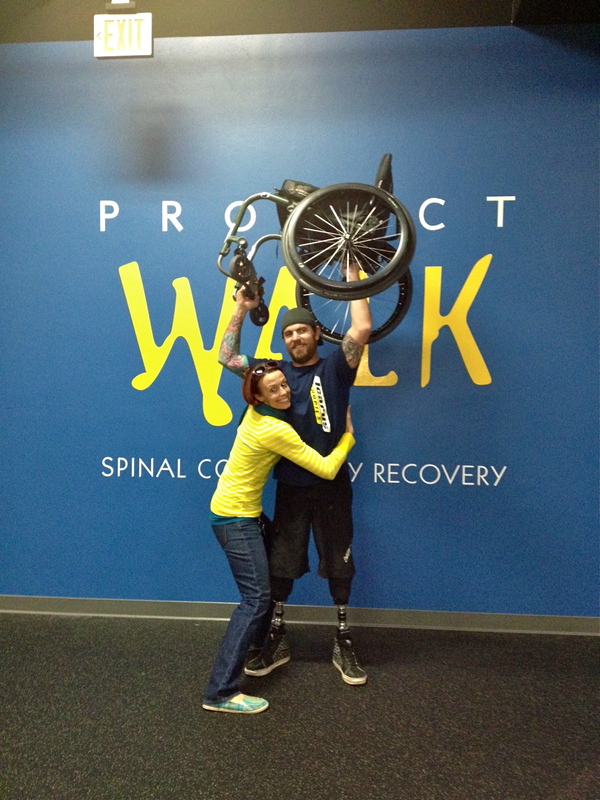 After exactly one year of making the hour-long drive down to Project Walk three times a week for Nick’s two-hour grueling sessions, Nick did his last workout with Bri. There was a mini celebration, lots of hugs, and tons of pictures and video being taken. So so so proud of my love! Ahhh what a ride it’s been. During the actual workout they tried something new with Nick that completely blew us all away. Nick ran across the floor for the first time ever! The harness he’s wearing is not holding him up, it’s just for safety, and he did end up needing it once or twice during his first attempts. His new feet with more springy toes and new sockets that attach with a vacuum system have made it much easier for him to be steady on his feet. I’m pretty sure he could not have run like this with his old legs and feet. Action! Eric spent an hour with us taking video of Nick’s last workout. Recording Nick’s workout means instant feedback. Each run he did was better than the last. 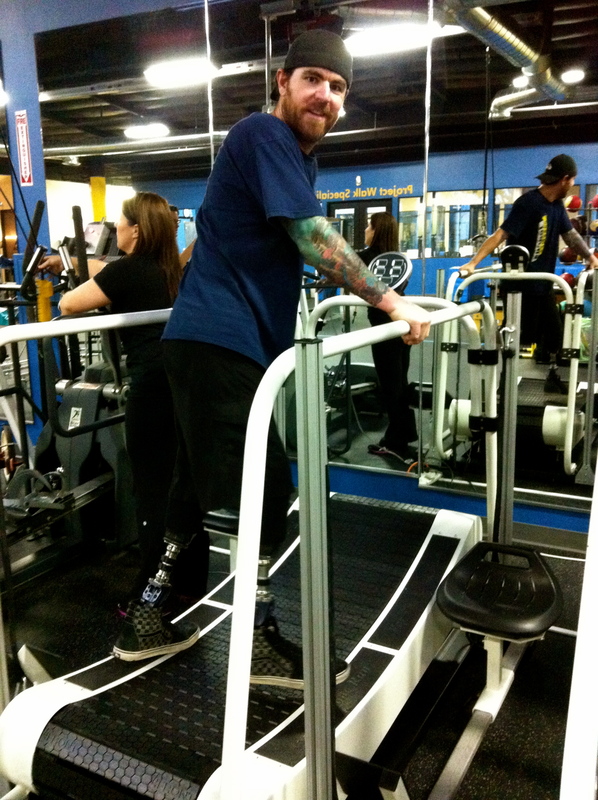 Nick trying to run on the Woodway treadmill. It’s curved, so it’s propelled with each step he takes. 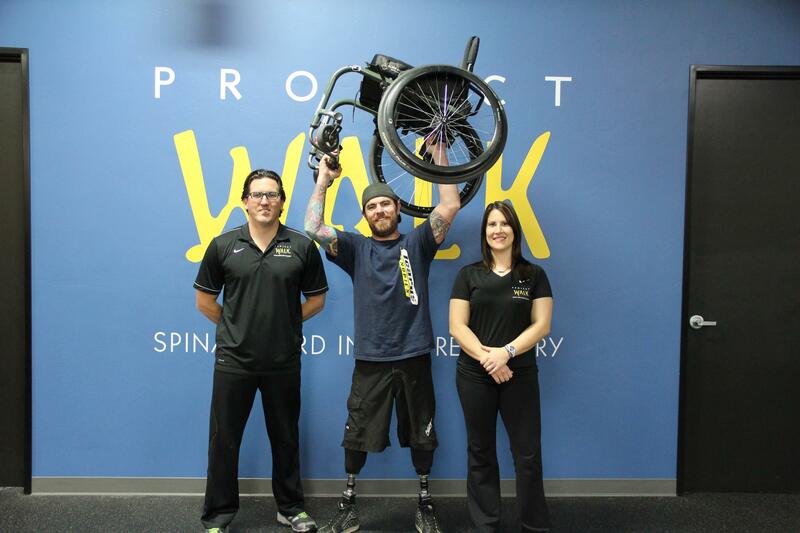 This particular one was designed specifically for spinal cord injury patients at Project Walk. Driving away from Project Walk that day was sad but exciting. We were quiet in the car for a while, digesting the magnitude of what just happened. It really feels like only a few months ago that we were giddy with anticipation of his first session and what amazing changes it would bring to our lives. Looking back at a year spent at Project Walk ignites a fire of gratitude for me. Not only was it a hefty investment that we’d make ten times over again, we know it wouldn’t have been possible without all the fundraising from our friends and family. 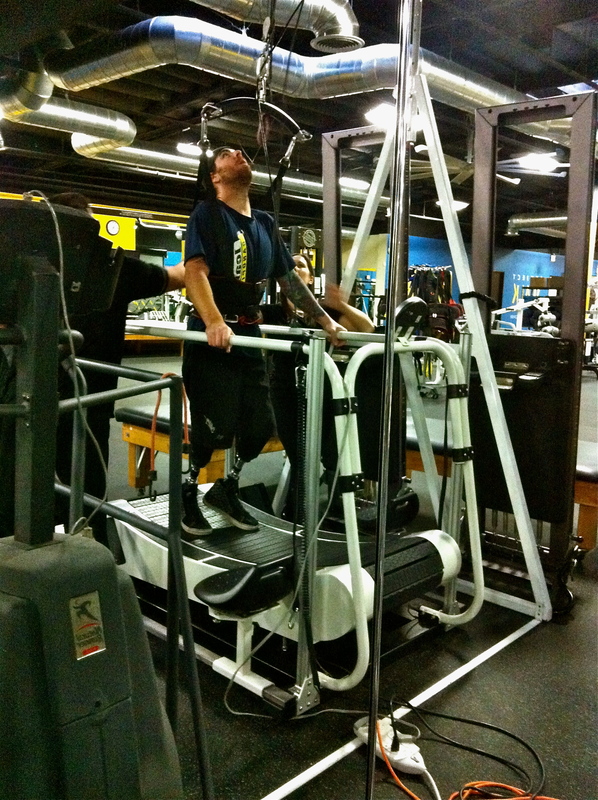 What a privilege to be able to afford such leading-edge therapy and do whatever it took to get Nick’s life back. I’m grateful that Nick was able to see an “end” to his therapy at Project Walk at all. That he can be mobile enough to no longer require their specialized facility. That he can workout here at home on his own and work with a more local personal trainer as well. I can’t help but smile when I feel Bri’s encouraging words dance through my mind, “Nick, you’re now less like a person with a spinal cord injury, and more like a weak able-bodied person.” Every moment is a reminder of how far he’s come. Without Project Walk, I don’t know where we’d be right now, but I’m confident it wouldn’t be here, staring eagerly into the future, delighting in the countless possibilities to chase and create. Feeling joy in the unknowns, rather than confusion and sorrow. Thank you Project Walk, Eric, Bri, and everyone who made us feel at home every single day. We will miss you guys! Dan BC's book "Above All Else"